Naveen Kumar, who works for a Hindi newspaper, was passing through the incident site on a bike along with his journalist friend Vindod Singh after covering a rally. 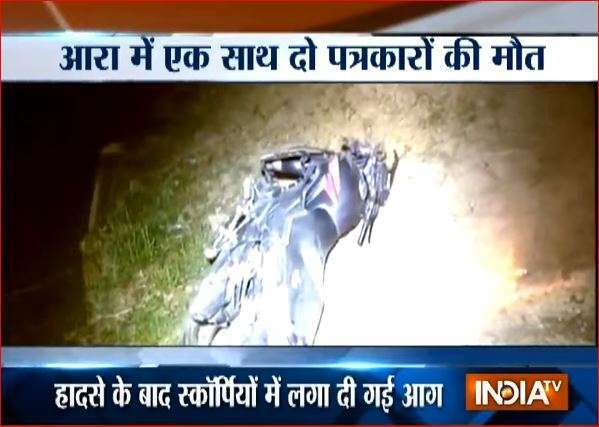 Two journalists were killed near Nahsi village in Bhojpuri district of Bihar after an SUV rammed into their bike on Sunday. The family of the victims, Naveen Kumar and Vinod Singh, have alleged that the two journalists were in fact murdered. A speeding SUV came from behind and rammed into their bike. The two journalists died on the spot. The irate residents of the area put the SUV on fire although the driver managed to escape from the spot. The residents turned violent as they alleged that the police did not take any action action despite Naveen Kumar informing them a few days back that there was a serious threat to his life. According to reports, Naveen Kumar had a tiff with Harsu, former mukhiya of Gadahani panchayat, over some of his reports. The mukhiya had reportedly threatened Naveen and other reporters with dire consequences.
" Irate villagers intercepted the vehicle, but its occupants fled. The mob set the SUV on fire," Avakash Kumar, Superintendent of Police, Bhojpur, said. "Rajesh, brother of Naveen, had alleged in the FIR that it was a case of murder and a former Panchayat Mukhiya Ahmed Ali alias Harsu and his son Dabloo were behind it," the SP added. The suspicion over the former mukhiya’s involvement in the murder of the two journalists further gained ground as the SUV belonged to him.